Further Adventures of Roy G. Biv, House Painter. In Italian, there is a color named Terra di Siena Naturale. In olden times it was called Scyricum or Sil Pressum. In English it is “Raw Sienna Earth” The highly technical name for the color is “brownish” or “like, you know, uh…sorta brown”. It is toxic; that is, if you eat the paint, you die. (That may be true of many other colors of paint, as well.) If you paint your house that color, however, you may raise fewer eyebrows than if you go with Naples yellow (something like ochre) or chrome yellow (something like chrome) or spincervino yellow (something like the color of the Asian shrub Rhamnus cathartica), which is also called verde di vescica—bladder green! Indeed, if you paint your house to make it resemble a bladder and you live next door to me, you and my spray-paint cans are not going to get along. Why should I care? I’m not sure. I was confused by Goethe’s Farbenlehre (Theory of Colors) before I got to page number chartreuse. 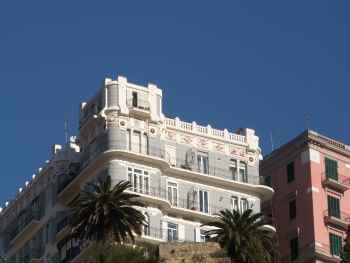 It’s just that someone in the newspaper this morning was moaning about the colors that buildings are painted in Naples; a “kaleidoscope of anarchy” he called it. Or maybe it was a “stethoscope of oligarchy”—whatever, it was bad. There is no attempt, said the whiner, to adhere to the published and official color guidelines. Well, there is no attempt to adhere to the published and official traffic-code definitions of red, green, and yellow, either, so maybe the whole city is color-blind. That city color code for painting buildings, by the way, was published in 1942, and, in fairness, it wasn’t that restrictive. You could paint your house white, grey, sand, hazel-brown, straw yellow, “ancient pink,” salmon, clear terra di Siena, or Pompeian red. So when I look around the city, although I do see a few “outlaw” shades of electric blue, generally I don’t see a lot of outrageous, garish colors, except perhaps the church of Santa Maria delle Catene (top photo, left). It was just redone in bright mustard. Also, in Bagnoli, they have recycled part of the old cement factory as a public venue and painted it “pimp scarlet.” White is making a comeback: the entire 300-yard long façade of the Albergo dei Poveri has been restored to its original white, and the restored Mergellina train station is back to its gleaming white. 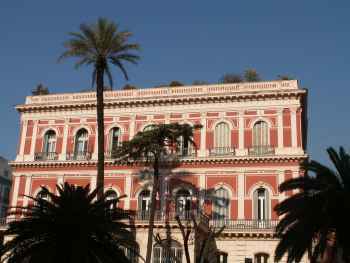 Pompeian red is still the default color of regal buildings and those with regal pretensions, such as the royal palace and the Naples prefecture. The colors of natural stone—marble, trachyte, tufa—have always been popular, and the newer and unpainted “natural” colors of metal are evident in many recent buildings—the Civic Center, for example. Some colors in Naples seem too bright just by comparison with some of the adjacent buildings that are still wearing that coat of WWII grime grey. 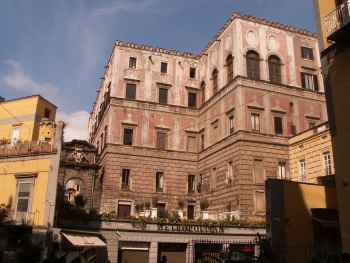 I would rather see one of the most historic Spanish buildings in Naples, the palazzo Cellammare (photo, right), any color than what it is at present —Pompeian red, but only if you can imagine Pompeii right after Mt. Vesuvius got through with it. This is because the condo dwellers within are too tight to pay for a decent paint job.